So this is a haul in place of a progress report. I was sick for the beginning of September, and worked on my Monarch Series for all of August so I don’t have much to report. I’ve done hauls before and gotten really positive feedback, and this time I bought a lot of things I wouldn’t usually reach for, and I have reasons behind them all so I thought it would be fun to write about! The other day I went to Joann’s and Michaels since I had a whole bunch of coupons and there were several appealing sales going on. I ended up getting almost everything I wanted, and left with enough fabric to complete four future projects….and ten yards of trim. The first thing I wanted were fall fashion fabrics. I had seen these a few days ago and decided against buying any. Mostly because they only had a few yards of each type, and if I have less then five yards of a fabric it’s unlikely to get used since my projects are all so large. Of course after I left the store I remembered that I already have fabrics that would match these perfectly. Bright red suiting I have leftover from my mountie costume, black and grey plaid I bought last year and haven’t used, and six yards of very dark grey suiting. 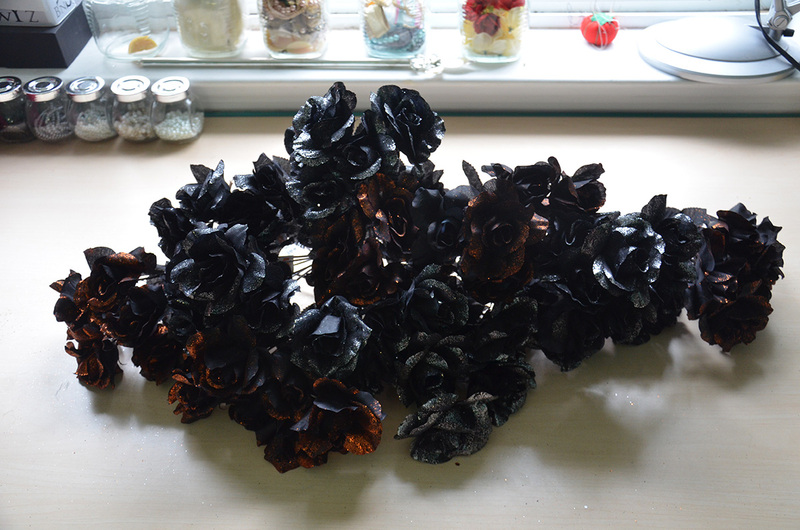 I’m still not sure what these will get turned into, but I think they would make really lovely skirts and sashes. 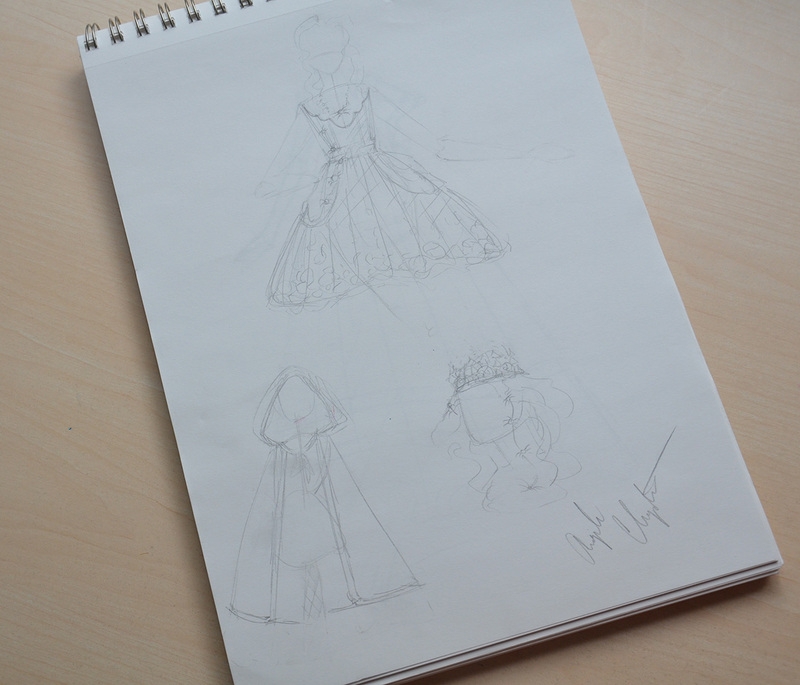 Maybe something red coat inspired? I definitely want to get back into doing military and menswear inspired projects so perhaps these will be the motivation I need. 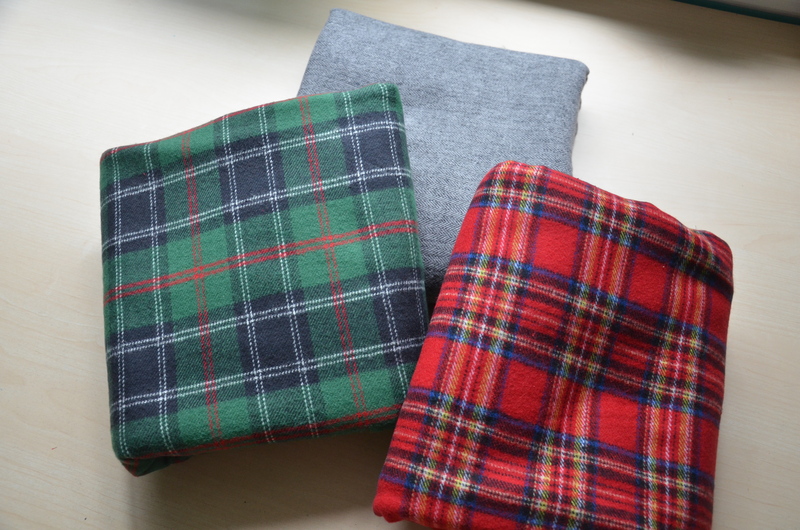 These fabrics are all really nice, they feel like lovely wool (even though i’m 100% sure they are cheap polyester) and with the sale they were only $5 a yard which is less then what I would pay in NYC. 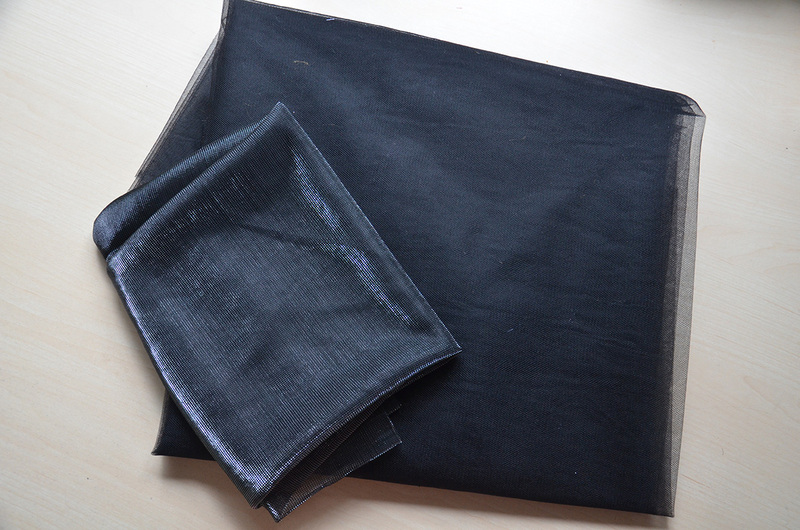 Here is the black and grey fabric I already have, paired with the new addition. Next up I wanted to get fabric for a Renaissance skirt. I know I need to branch out and make things from different time periods, but my Monarch series has been such a stretch for me that I want to have something fun and familiar in progress on the side. Besides I already have four yards of chocolate brown knit, two yards of printed brown material, and pheasant feathers with flecks of brown in them. I wanted fabric that would match what I already had, and there wasn’t much to pick from. After a lot of searching I found a roll of pin tucked taffeta hiding in the back that was perfect! I love the texture and sheen it has, and it’s really soft too. Quite nice quality considering where it came from. 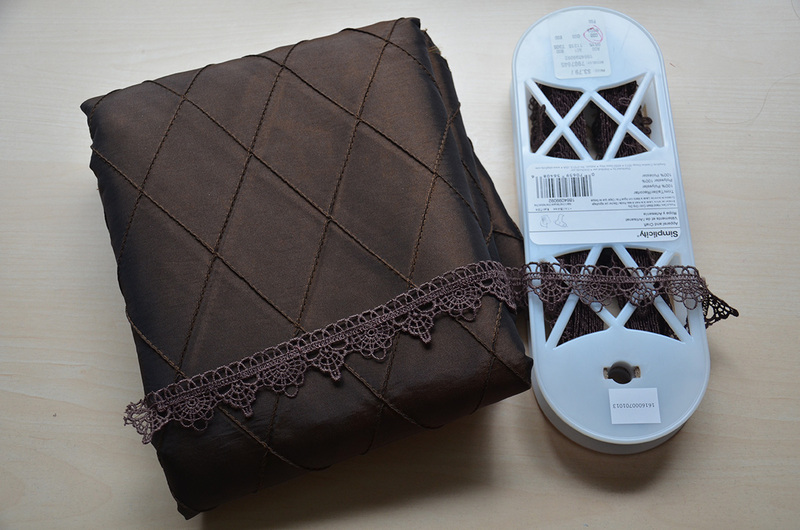 Trims were all 50% off so I ended up buying eight yards of matching brown lace. On the more boring side of things I picked up two yards of white eyelet lace (for a bonnet), and two packs of silver eyelets. Then I bought fabric which looks quite boring but is actually for a very exciting project. Five yards of matte tulle, and half a yard of silver mesh. I’m actually making a Halloween inspired project. It’s not a Halloween costume since I celebrate Halloween in my pajamas, eating candy corn, and handing out candy to neighbor hood children. When I make a post devoted to this project i’ll go into more detail, but for now i’ll say I don’t condone the excitement towards the “holiday”. However I had this idea. And when I saw Michaels had Halloween decor 40% off I needed to make the idea a reality. I’m not sure why but I really want to do something that is silly, tacky, and strange. It’s going to use some of the techniques seen in my other flower dresses but this one will be a lot more obnoxious. 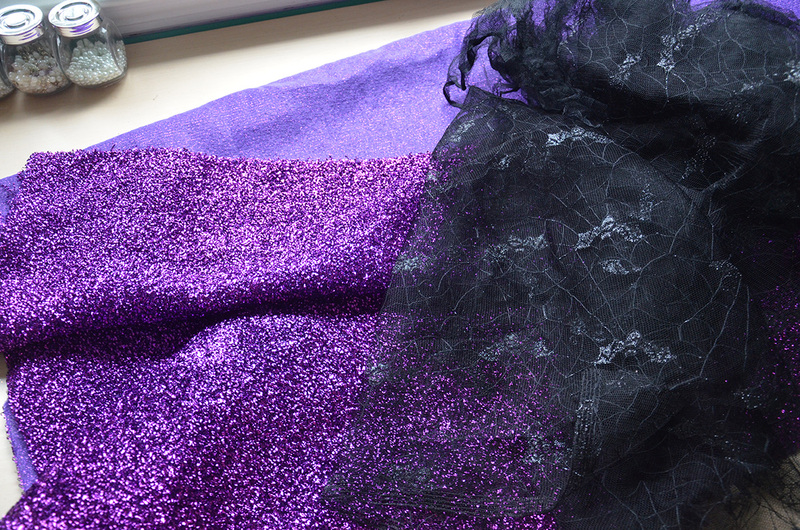 The base fabrics are going to be the black tulle and mesh, but I have this horribly tacky purple fabric that I think i’m going to turn into a cape. I also have some bat print material that will be an overlay on the bodice. Now onto what I bought at Michaels! I’m quite annoyed because the items I wanted were listed as being on sale but apparently were excluded because they are “seasonal floral decor” not “seasonal home decor” so I passed up some of the items I wanted and ended up spending more then I had planned. I’m still really happy with what I got though. 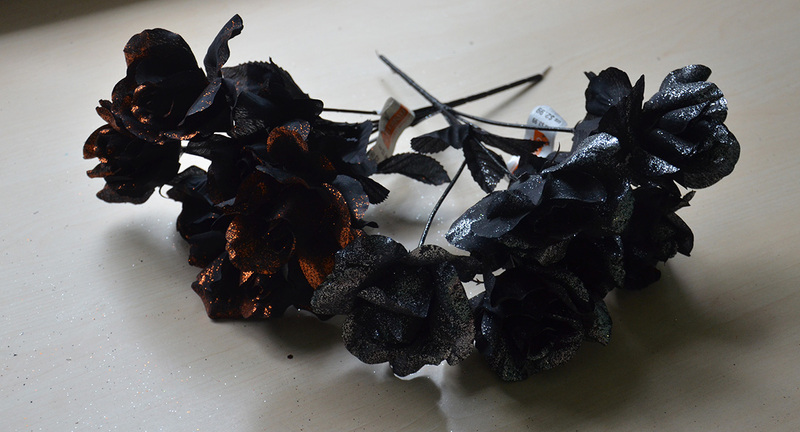 The main Item I wanted were glitter dipped black roses. These didn’t photograph very nicely – partially because i’m shooting against a window. Hopefully in the skirt they will look much better! 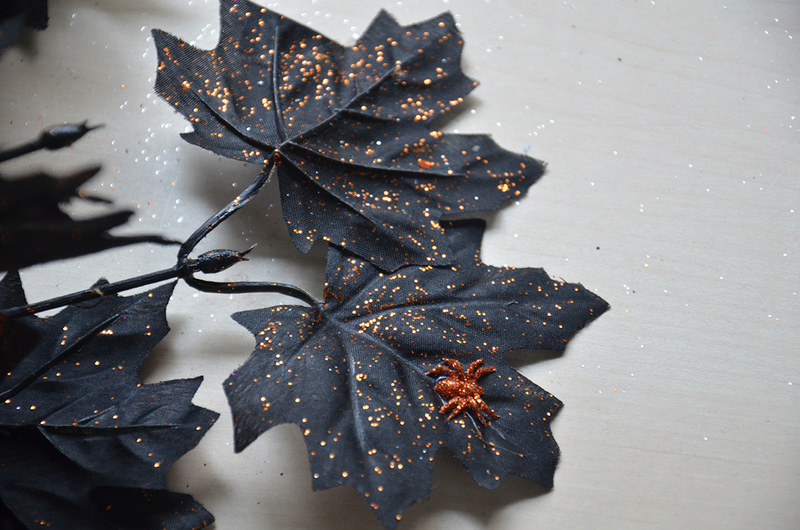 Then I got some black maple leaves which have glitter spiders on them. I’m not sure why I find these so adorable but I really, really do. 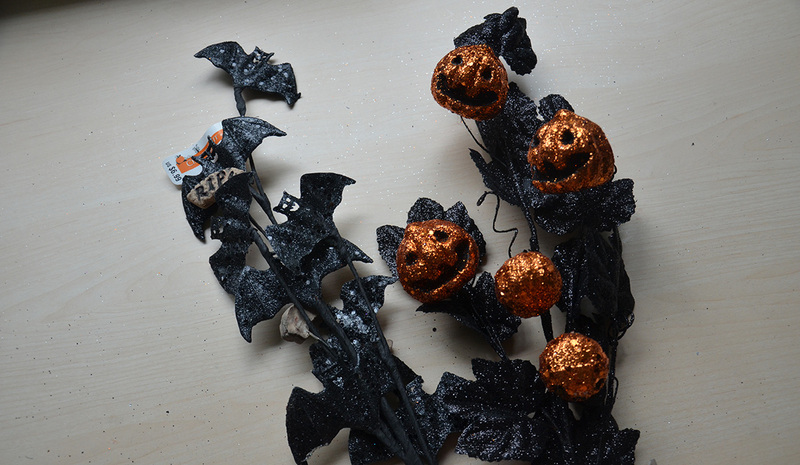 I got these glittery bats and pumpkins! These are probably my favorite items. Weirdly enough these were the only items I didn’t expect to be on sale, and they scanned up at clearance prices…I would have made different decisions if the sales were labeled better. 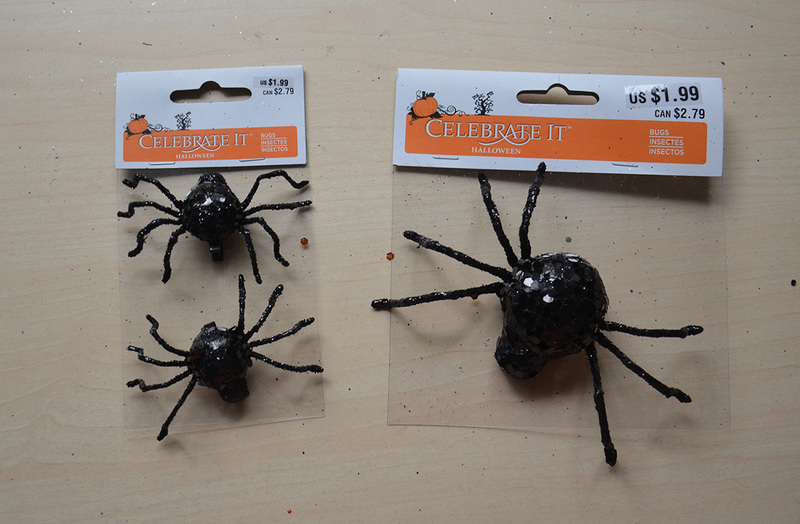 I got twenty four glitter spiders which will “crawl” across the dress. 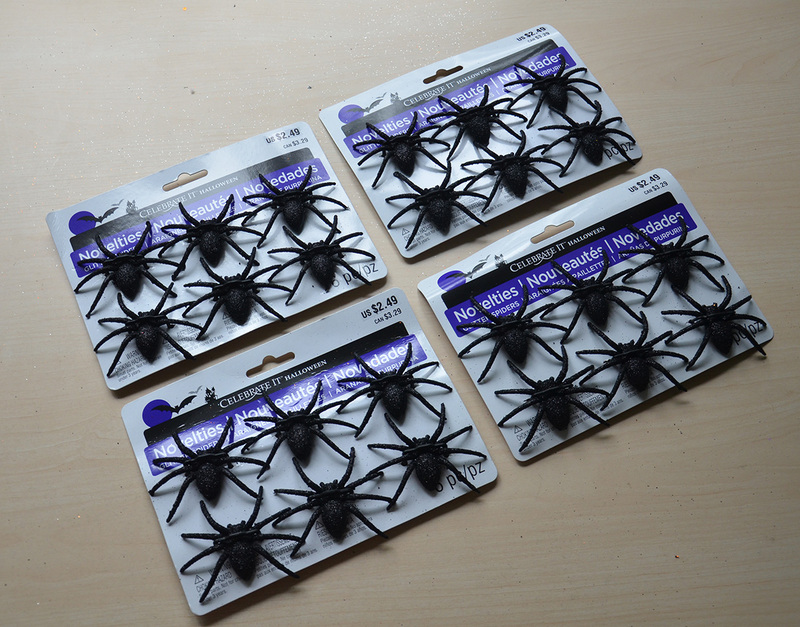 And three clip on spiders for the headpiece. 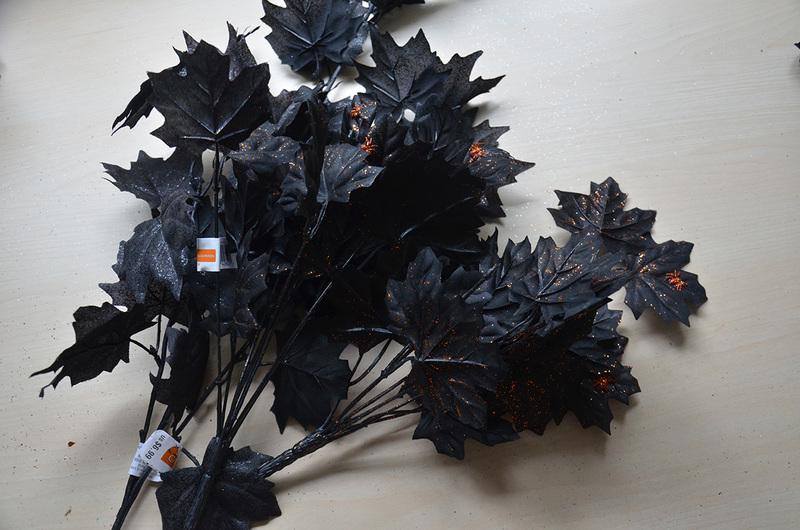 That was it for Halloween decor, but you may notice my selections are all a bit dark. That’s because most of the non black decorations were green or purple, and I wanted to stick to my black/orange/silver theme. 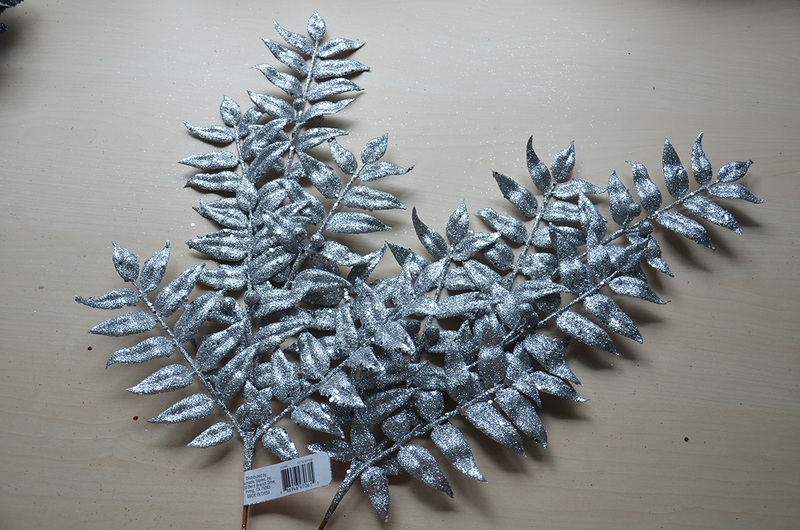 Luckily and aisle over they had Christmas decorations on sale, which ended up being exactly what I needed! 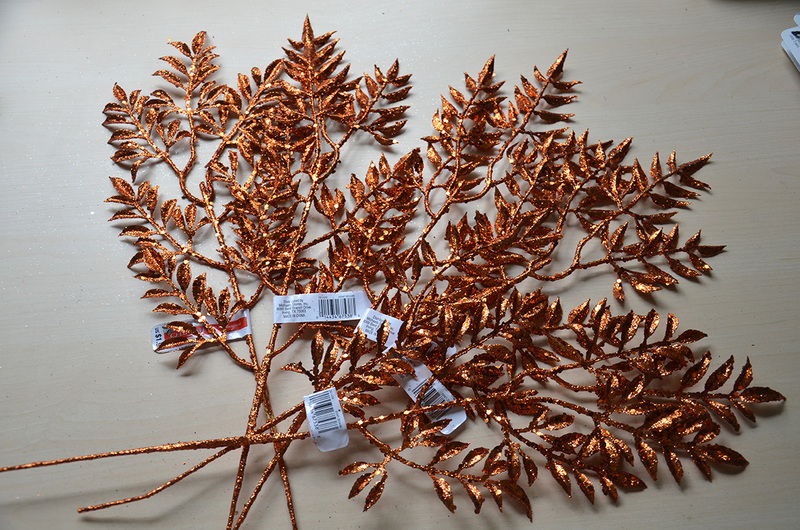 They are these super glittery sprigs that ended up being less then a dollar each! I love them so much. Such a good glitter/dollar value. I got eight of the orange ones and two of the silver. So that’s everything! Quite the shopping spree. I’m officially putting myself back on another two month shopping ban, because I have enough supplies for like ten different projects now, and I don’t have any excuse to keep buying stuff….until December when I have Christmas money, then it’s totally justifiable. Thanks for reading! I’ll have a “The making of” post soon. Lots of cool stuff you got there! I cant wait to see the next post! 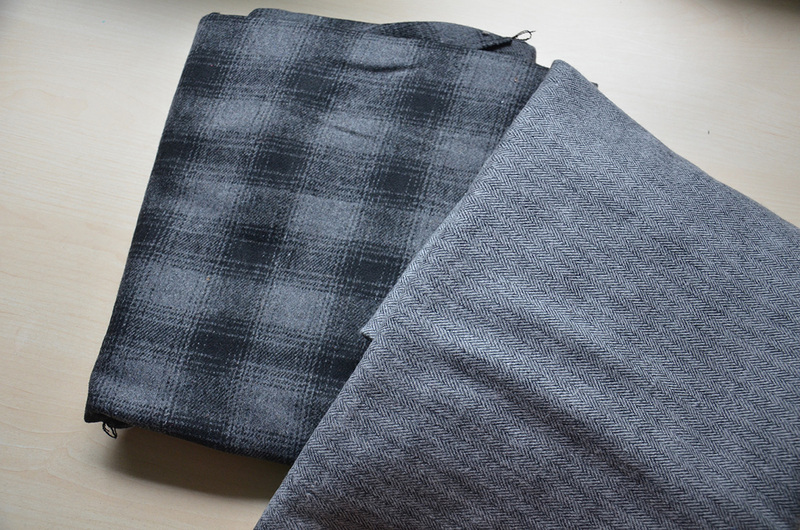 The gray non-plaid material in the bottom – I made a pair of pants out of that! Very nice feel, but it frays like CRAZY. Be super careful with giving your seams a little extra room! What do you do with all these amazing costumes?! I imagine a huge room filled with them!